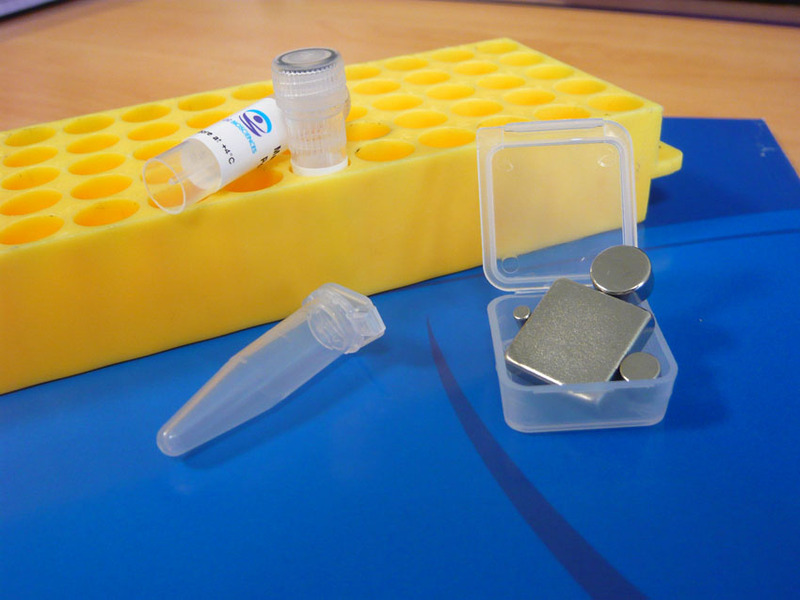 This kit includes in vivo PolyMag™ Transfection Reagent and a magnet set. In vivo PolyMag™ Transfection Reagent is a cationic polymer-based magnetic nanoparticles formulation designed for in vivo targeted transfection of nucleic acids. Targeted delivery minimizes systemic distribution, decreases gene vectors inactivation and reduces toxicity. The use of magnetic forces enhances the uptake of magnetic nanoparticles by the target tissue, improving the efficiency of transfection and decreasing the required process time of delivery to only a few minutes. In vivo PolyMag is suitable for all types of nucleic acid DNA complexes. It can be easily administrated through both systemic administration, such as intravenous and intra-artery injection, and local administration, such as intratumoral, intracerebroventricular, intraperitoneal, intramuscular and subcutaneous injection. Figure 1: High efficiency of in vivo PolyMag for targeted gene delivery after intravenous injection. Luciferase expression 42h after injection of reporter gene complexed with in vivo PolyMag nanoparticles into rabbit ear artery. Gene expression was found primarily at the magnet position site. As a control, the same vector composition was injected in the contralateral vessel without application of a magnet. No significant reporter gene expression was found. Figure 2: The magnet set includes 1 extra small cylinder magnet (2mm diameter), 1 small cylinder magnet (5mm diameter), 1 cylinder magnet (10mm diameter) and 1 square magnet (18 x 18mm).